The National Science Foundation has awarded an International Research Experiences for Students (IRES) program to provide four weeks of geological field-based research and training experiences across Slovakia for undergraduate and graduate students. These students will investigate geological processes that occurred in Slovakia due to the closure of branches of ancient ocean basins. Because of its extensive exposures of ocean suture zones and crustal fragments, Slovakia is an ideal location to study how continents grow. (A) Deep Time Map™ produced by Colorado Plateau Geosystems, Inc showing the paleogeography of the Alpine Fold and Thrust belt ~50 Ma. The locations of Slovakia and Turkey are indicated. (B) Geologic map of the same region outlining major tectonic components of the belt (Woudloper, 2009). (C) Another Deep Time Map™ showing the North American plate and the location of Texas ca. 50 Ma. In this program, students partner with Slovak researchers to explore a multidisciplinary range of geological concepts discussed in their courses. Students visit field areas across Slovakia to develop a regional-scale perspective. Each region that will be visited has a central hypothesis in the form of a geodynamic model developed by or with the involvement of former IRES students that will be tested. All IRES students will undergo an intense pre- and post-departure program designed with the assistance of Slovak colleagues and numerous UT Austin resources. Undergraduate students chosen to participate will be underrepresented in the geosciences and are selected via Jackson School and UT Austin outreach programs. This IRES program has societal value, as paleogeographic reconstructions like the one in the image are often to identify critical economic resources that formed during specific times in Earth’s history and assess geologic hazards that result due to reactivation of older faults or mass movement of rocks. 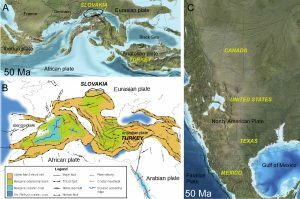 For example, during the Late Cretaceous, Texas was a region of sediment deposition that will have implications for future oil and gas resources, while Slovakia was undergoing arc-arc collision and metamorphism. In this program, students will apply new and innovative field mapping, geochemical, and geochronological methods, lending greater insight into the history and mechanics of the assembly of the country.